First Christian Church - SERMONS - Jesus: Lord or Assistant? John 6 is one of the more dramatic passages in Scripture, because it contains miracles, profound teaching, a call for commitment, and surprisingly, most of Christ’s followers leave Him. It’s a scene, similar to today, in which people literally left Jesus in droves because they didn’t understand what Jesus was saying, they didn’t want to commit their lives to Him, and He quit giving them what they wanted. John 6 begins when Jesus was at the height of His popularity. Word had spread about miraculous healings and inspirational teaching. Huge crowds were traveling with Jesus. After a full day, Jesus knows the people are hungry. Rather than send them away, Jesus uses a boy’s lunch of five small barley loaves and two small fish to feed the entire crowd the size of DeQueen. After everyone had their fill, there was still plenty of food left over. Later, the crowd camps out for the night so they can be with Jesus the next day. In the morning, they’re hungry again. Eventually, they figure out that Jesus crossed over to the other side of the lake. So, they go to the other side of the lake, but Jesus has shut down the “all you can eat” buffet. He knows that these people are not following Him, but they are following the food. In John 6:26-27 Jesus answered, "I tell you the truth, you are looking for me, not because you saw miraculous signs but because you ate the loaves and had your fill. Do not work for food that spoils, but for food that endures to eternal life, which the Son of Man will give you. When Jesus is the only thing on the menu, we find out if He’s the One we are really hungry for. When there are no other options, that’s when we find out if Jesus is enough. When He stops giving us things, He brings us into the place where we can begin to understand Him. This is what Jesus is after. As long as we get from Him everything we ask for, we never get to know Him, and we look upon Him as an assistant to our life instead of the Lord of our life. Unfortunately, most people won’t accept Christ’s invitation. They like Jesus. They like the idea of Heaven. They like the miracles. They like the bread, the church dinners. They like the excitement and activities, the children’s program, and even the fellowship. But when Jesus wipes all that off the table and offers only Himself, they leave to find those things elsewhere. But what happens to our commitment if these things don’t come to pass for us? How committed to Jesus are we when we realize He’s not our “assistant” to accomplish our goals and meet our desires? The same people in John 6, who were quick to follow Christ, were just as quick to reject Him. Disappointed, they left, giving up on Him. We see many doing that today. We continually have to ask ourselves, “Are we still serving the Lord faithfully and sacrificially? Or have we drifted into a ‘bless me’ mentality?” Christ knew exactly where the peoples’ hearts were when they began following Him. That’s why after performing a great miracle for those multitudes, He confronted them: “I tell you the truth, you are looking for me, not because you saw miraculous signs but because you ate the loaves and had your fill.” Is the same true of us today? Do we follow Jesus mainly because of He assists us and blesses us, or because He is Lord? Let’s be honest, when we pray, we often have a Burger King religion. We want to “have it our way”. We want Jesus to fill our order quickly. However, if Jesus is our Lord, we understand He won’t bend to our lusts to give us everything we want, when we want it. He has a higher purpose. His desire is to have a relationship with us—an eternal, intimate relationship that produces the fruit of the Holy Spirit. But for the crowds in Jesus’ day (and for many today), a relationship wasn’t enough. They were thinking of themselves. They wanted Jesus to be a “Burger King” or a personal assistant, but not their Lord. At the root of this mentality is the same question Satan introduced in the Garden of Eden and many Christians today wonder as well: “If God withholds something that you want, is God really good?” As long as He gives us everything we ask, we consider Him good and we follow Him. But, do we believe God is as good in the hard times, when our prayers are not answered immediately? We rejoice whenever someone testifies, “Praise God, I can pay my rent this month!” Yet God doesn’t stop being good when that same person has to rent a U-Haul truck the next month because they can no longer afford their apartment. God never stops being good, no matter what. When that happens, rebuke that liar, in the Name of Jesus! Draw near to God and you will hear the Holy Spirit whisper, “I see your need and your anguish. Don’t be afraid and don’t be angry at me. Trust me. Do you realize how much I love you?” Often in our trials, God wants to show us what is in our hearts so we may grow in this cherished relationship. Jesus had another question for those disciples and this question is for every believer today. As the crowds began leaving, Christ turned to the twelve in verse 67 and asked, "You do not want to leave too, do you?" This is a question for everyone whose prayer hasn’t been answered the way they’ve wanted; whose marriage is on the brink; whose physical healing hasn’t come; who is in the battle of their life—in other words, everyone who is disappointed with God and tempted by Satan to turn away. Peter seemed to grasp who Jesus is. In verses 68-69, Simon Peter answered him, "Lord, to whom shall we go? You have the words of eternal life. We believe and know that you are the Holy One of God." What a moment for the disciples—and for us who believe today! Our faith isn’t based on what Jesus gives us. It’s based on our relationship with Him, and who we know Him to be: compassionate, merciful, faithful, Almighty God, and Lord of all! Best of all, this relationship doesn’t hinge on our performance but on His faithfulness. He has called us to serve Him, and so, He will not leave us. Therefore, brothers and sisters, hold on to your faith and get to KNOW Jesus and love Him completely. Because, if we don’t know Him and love Him with all our heart, we will leave Jesus when His teaching gets difficult, when He doesn’t do what we want, when He asks us to sacrifice, when He asks us to take up our cross, and when He asks us to die to ourselves. We will leave Him and find someone else that tickles our ears. On the other hand, when we really know Jesus as Lord, we don’t want to leave Him. Because if we know Jesus as God Almighty, Savior, and Lord; if we are 100% positive that following Jesus will lead to an eternity of bliss and worship and joy in His presence, and have no doubt that He is the only way out of Hell, we will follow Jesus. Who wouldn’t follow Jesus if they were 100% sure? The problem is: people were not sure then, and they are not sure today. Are you sure? If all of us believed with every ounce of our being, we’d have a much easier time accepting some of the harder portions of Scripture. We wouldn’t grumble and complain if the Bible differed from our point of view. We wouldn’t doubt its authenticity and think it needed to be updated to fit our culture. If all of us knew and believed the way Peter did, we’d be willing to stand strong for God’s teaching on sin. If all of us knew and believed 100% that Jesus was Lord, we’d share our faith more boldly and live like we believe it. Jesus knew what the crowd in John 6 was thinking and what motivated them. He also knows the hidden motives and agendas that stand behind our thought processes. He knows every decision we must make and problem we are going through. This should be a great comfort to us. Because since He knows, understands, loves, and corrects us, we can have His peace, knowing He is in full control of everything. Even the evil generated by Satan and sin, He is able to work towards our good and His purpose. In spite of all Satan’s attacks on us, He is able to present us spotless before the throne of God. That is where our salvation abides in perfect security. Jesus Christ has full absolute power. He can do anything for anybody in keeping with His own character and purpose. He even has power over death. In Christ, we have eternal life and will inherit a glorified body like His. This implies that Jesus’ character and eternal purposes do not change, which gives a solid foundation for our faith and hope. We can depend on Him. Jesus is unchanging in His being, purposes, and promises. Jesus can always be trusted because He always keeps His word. There never will come a time when Jesus will cease to be. All that He is today, He has always been, and always will be. He can’t change for the better, because He is already perfect. He won’t change for the worse because that is impossible, being the perfect One. He is completely unaffected by anything outside of Himself. The people in John 6 were hungry for what Jesus could give them. However, Jesus wanted them to be hungry for Him. He wants that for us, too. In other words, blessed are those whose appetites, obsessions, and fondest desires are fixed on Jesus and His kingdom. Blessed are those who desire righteousness like the starving yearn for food and the thirsty long for water. Such a rare person runs counter to the tendencies of the day, to the popular fads and fashions of the hour, to the passions of the moment. Our world hungers for the basest and pettiest things. It lusts for immediate gratification. It yearns for the titillating, the numbing, and the diversionary. Anyone who demonstrates a hunger for the holy, unknowingly produces conviction in those living in sin. That is why they persecute those who hunger for righteousness. That righteous hunger is the power of the Holy Spirit in their lives. It is a witness that Jesus Christ is their Lord, not their assistant. Combined with God’s love, they show that Jesus is alive! Beware of a counterfeit faith that confuses “being nice” with zeal and fervor. There are programs that increase church attendance, but fail to fire us with passion. There is a form of religion that mimics holiness, but is devoid of the life-changing power of the Holy Spirit. It is a counterfeit faith in large numbers, in programs from the world, and in religion without a hunger for righteousness. 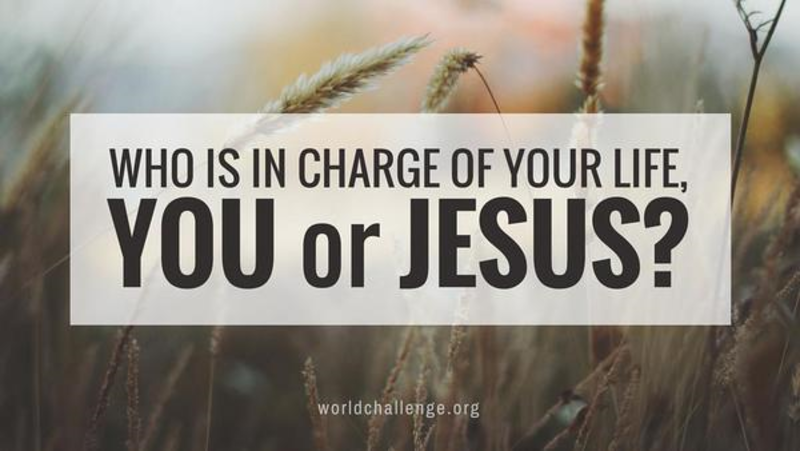 It is causing us to make Jesus our assistant instead of our Lord. It does not make any demands for commitment or obedience, and everyone goes to Heaven. It is a counterfeit from Satan. And it is sending many people to Hell! What will our response be today to His question? Do we believe 100% that Jesus is Lord? If so, will we follow Him regardless of the hardness of His word or the difficultly of our situation—simply because He is Lord? We need to be 100% sure Jesus is Lord and 100% committed to Him, because this world is becoming increasingly wicked. Every day we have to decide whether or not we will follow Jesus. Jesus warned in Matthew 24:12-13 Because of the increase of wickedness, the love of most will grow cold, but he who stands firm to the end will be saved. I pray we will all be in the minority—that our love for Christ will only grow more fervent as the wickedness increases. As the world gets darker, keep your eyes on Jesus—the light of the world. Stand firm in His love, His promises, and His power. Continue to do His will without grumbling and complaining. Give thanks in all circumstances and rejoice, for He is coming again as KING OF KINGS AND LORD OF LORDS!